Welcome to The Fourth Wall, CHIRP's weekly e-conversation on cinema. 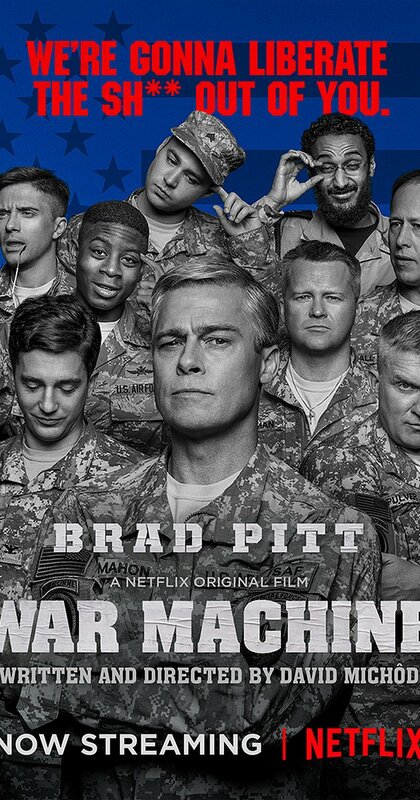 This week's subject is the Brad Pitt comedy War Machine. It's actually made me think quite a bit about the nature of the genre and the subjective nature of humor. In my estimation, most attempts at comedy in film and television just try too damn hard, and my preferred brand of levity arrives in the midst of tales that are generally on the level. Dramas like The Sopranos and The Wire were wickedly funny at times -- Paulie Walnuts, when he wasn't a vicious sociopath, almost qualified as comedy relief. Clarence, you and I have discussed the genius of Extras in the past; even when celebrities in that series were playing caricatures of themselves, I can't ever remember them winking at the camera. Which brings us to War Machine, a military satire based on the non-fiction book The Operators, an account of writer Michael Hastings' month-long stay with General Stanley McChrystal's forces in the Afghanistan war. The basis for the book was Hastings' article "The Runaway General," a 2010 feature in Rolling Stone which captured not only the chaos of the fight, but also McChrystal's mocking of White House officials (including VP Joe Biden), which ultimately resulted in his resignation. Hey, this sounds like a fascinating subject for a film! But couldn't they have gotten someone other than Brad Pitt to play the McChrystal character, Gen. Glen McMahon? I'm guessing Hollywood studios demanded a star. Fine. Then why demand that Pitt utter every line with an overblown, gravely voice? The man sounded like JK Simmons in full-on J. Jonah Jameson mode from the Spider Man films. It's bad enough with any actor, but even worse with Pitt, who isn't exactly someone who gets "lost" in parts. He's the definition of a modern movie star, in that he basically plays himself (or at least the Pitt-brand persona) in every film. With him in full-ham mode, It's hard to take anything the guy says seriously, and I was jolted out of the story from the get-go. We've got the usual butting of heads between the military brass and the civilian leadership (which is focused primarily on the upcoming elections) as well as the view on the ground from the hapless soldiers who can't make heads or tails out of directives which command them to wage war with the enemy while befriending the civilians... when both groups basically look like the same population. As far as this last quandary, I think it's a message that was better delivered in films about Vietnam, such as the soldier interviews in Full Metal Jacket? And we've already seen scores of super-slick, PR-conscious pols in films such as Wag the Dog and The American President. What did you think of the film and Pitt's performance, Clarence, and also what are your thoughts on the subject of military satire in general? It's a genre mash-up that's not often employed -- and offhand, I can't think of a single comedic film about the Vietnam War. Kevin, as I slogged through War Machine, trying desperately to keep from falling asleep out of sheer boredom, I couldn't help but think that there is a good idea for a movie here. There's an overall theme not just about the sheer futility of America's excursion into Afghanistan, but also how the US military has become a business, not just for the corporations making billions selling weapons to the government but also career soldiers like General McChrystal who are as concerned, if not more concerned, with their own legacy and stature as they are about winning battles and making the world safe for democracy. Someone somewhere could make a sharp, insightful movie about this. War Machine is not it. You and I are in total agreement in that Brad Pitt just not right for the part. To me, his voice sounds like he's doing an imitation of his buddy George Clooney doing an imitation of Clint Eastwood. The rest is a character who's basically just a list of physical tics who's surrounded by a group of one-dimensional characters not worth knowing, much less caring about. Funny thing is, I don't think this movie would have been made without Pitt, who is also one of the film's producers. I'll give him credit in that he's one of a very small group of name actors who uses their clout to create projects that at least try to address current political issues. But the whole of War Machine is far less than the sum of its parts. I feel like the film was trying to set up a The Big Short kind of satire where the audience is expected to respond to the absurdity of it all. And it just doesn't work. To me, this movie highlights the lack of other movies about the War in the Middle East. The US has been at war in the Middle east for almost 15 years now. In that time I think I can count on one hand the number of major studio films that went into wide release that focused on the story of this war or what it's like to fight it. There's Three Kings, The Hurt Locker, Jarhead, Lone Survivor, and....can you think of any others? Contrast this with World War II, when Hollywood put its full weight behind making films of all genres based on that conflict. Yes, most of those films were propaganda in some way, but there were also satirical projects that criticized and made fun of everything from war profiteering to the daily grind of foot soldiers. Vietnam was different in its outright condemnation of the war and what it did to the US soldiers who fought it. A comedic, possibly satiric, Vietnam picture that comes to mind for me is the Robin Williams movie Good Morning, Vietnam, although that's not so much a satire as a platform for Williams to chew scenery left and right [then again, let's be honest, when is he NOT chewing scenery in one of his movies?]. And of course there was MASH (the movie that begat the long-running TV series), which was based in the Korean War but released in 1970 during the Vietnam war and clearly has an anti-war sentiment. I'm not nearly as a big a fan of this movie as film historians, mainly because its "humor" is just the main characters expressing their rebellion by being smug a**holes toward others. We now live in an environment where one of the Commander-in-Chief's main messages to people at the start of war was to "carry on as normal and keep shopping," while caskets of U.S. soldiers killed in action arrived back home at night so as to avoid TV cameras. There is obviously plenty of other news in America to distract the public from the fighting in countries that many Americans couldn't find on a map. I wonder, even if more satiric and anti-war films appeared in theaters (better ones than War Machine), would it even matter? There's that oft-mentioned quote in Crimes and Misdemeanors about how "comedy is tragedy plus time" (originally from comedian Steve Allen), and I wonder if that's especially true with regards to political/war satire? Perhaps there just isn't enough space between the present day and the events depicted in films like War Machine? It doesn't seem so bad to laugh at the crucified in Monty Python's Life of Brian, yet chuckling at the predicament of POWs in a Vietnamese camp would feel downright obscene. It's also one reason why like Starship Troopers actually works well -- a film set in the 23rd century, with vicious-looking aliens as the enemy, can feature a lot of wicked satire about war that wouldn't fly in a modern-tale tale. Starship Troopers, from director Paul Verhoeven (who also directed the darkly-humorous RoboCop), was generally panned by critics when it was released in 1997; in retrospect, it's perplexing how many of them treated the story as serious fare rather than the satire it was. Among other aspects of war, Troopers directly pokes holes in America's propaganda machine -- such as the Why We Fight films which were made by Frank Capra to build support for the the effort in World War II. Think about that film series for a second. Suppose the Bush administration had successfully commissioned Steven Spielberg to make movies that would sell the Iraq War to the public. Imagine the outrage? (It'd also be the death of Spielberg's career, most likely, whereas Capra won an Academy Award for his efforts.) We can argue that fighting Nazis was very different than toppling Saddam, but before the Pearl Harbor attacks, American public sentiment was certainly not gung-ho about getting involved in Europe's wars. Another sci-fi production that benefited from narrative distance was the Battlestar Galactica remake that aired in the mid-'00s, right around the time of the Iraq War. Are we sure we know the difference between a terrorist and a resistance fighter? BG blurred those lines quite adroitly, with the show's heroes resorting to tactics such as suicide bombings in the face of occupation. I'd add one major release to your list of films about the wars in the Middle East: 2014's American Sniper, a biopic of Marine marksman Chris Kyle which received a slew of Oscar nominations and was the highest-grossing war picture in history. I'll close by posing a question for you -- who's the audience for the modern war satire? If you're someone who generally wants to see our troops and commanders as heroes, you likely won't be watching something like War Machine. And if you're someone who finds our involvement in foreign wars rather deflating, you're probably not going to be that interested in spending more time in that world either. So who's left? I think there might be an audience for satire for the War on Terror and/or the War in the Middle East. Off the top of my head, I picture an audience of people who are politically aware, who don't have to consider military service as a career option, and who don't trust the mainstream media. This is the group of people that would watch Starship Troopers and pick up on its fascist imagery and hyperbolic characters and get a different message than someone more enthralled with the action sequences and scenes of brotherhood and sacrifice. Would that be a large enough market for a studio to invest in that kind of project? I'm not sure, even at the independent film level. A Battlestar Galactica-type TV series that couches the debate in a fictional narrative might be the kind of delivery system needed. It's interesting that for movies like Lone Survivor and American Sniper, the focus is squarely on the experience of the individual soldier rather than the rightness of the cause. By now, with so many Americans knowing someone who has been overseas fighting in this war, it's easier to connect with stories about the toll it takes on people rather than the reasons it is being fought. I don't think I'm being too radical when I say that our government would prefer that the people not focus on either of these things, but if given an option, it'd rather the public concern themselves more with the former. Which brings me to one more major difference between our current conflict and what came before it -- there doesn't seem to be an end in sight. Not to trivialize the lives impacted on all sides, but the powers-that-be seem to be stuck producing a reality show with no finale. It's hard to put anything into historical or artistic context until it's over. Until then, the best satire we'll get might come from CNN. Share August 25, 2017 • http://chrp.at/1qvS • Share on Facebook • Tweet This! Previous entry: Classic Album Sundays Presents Off the Wall on August 27th!